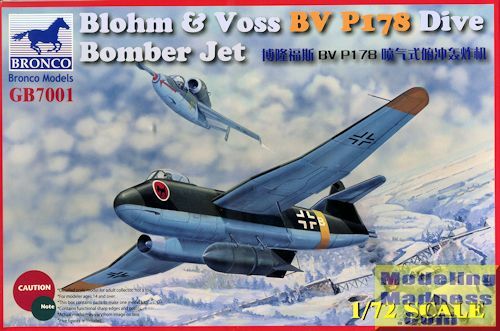 The Blohm & Voss P.178 was an experimental jet-powered dive bomber designed during World War II by Blohm & Voss. The bomber had an unusual, asymmetric configuration. This asymmetrically-designed dive bomber had one Junkers Jumo 004B turbojet located under the wing to the starboard side of the fuselage. The pilot sat in a cockpit in the forward fuselage, with a large fuel tank located to the rear of the cockpit. Beneath the fuel tank, there was a deep recess in which an SC 500 bomb could be carried within the fuselage, or an SC 1000 bomb which would protrude slightly out of the fuselage. Two solid-fuel auxiliary rockets extended from the rear, used for take-off. Two 15 mm (.60 in) MG 151 cannons were located in the nose. Perhaps Bronco is trying to restart what has been a quiescent Luft '46 market as few if any new kits have been done over the years. I am not sure if this subject has been produced by either short run or resin kit, but this one is neither. There are five grey sprues attached in two major sections along with a clear sprue. Typical of current 1/72 aircraft kits, the interior is well done, but Spartan, with a tub, seat, control stick, rudder pedals and an instrument panel. This sits atop the nose gear well piece. The instructions show 10 grams of weight being needed, but finding room for it will take a bit of work and most will pack weight behind the cockpit. The wings are two upper and lower halves and there is some wheel well detail provided. Main gear is properly beefy with a separate oleo scissor and retraction strut. Same goes for the nose gear. The model can be built gear up and separate gear door sections are provided for that option. The nose is separate from the rest of the fuselage, and this may well mean other similar aircraft will be offered in the future. There is a small bomb bay area in the back with a separate door that effectively seals off this area. A four piece engine will fit under the right wing and both wings have large tabs that go into slots in the fuselage. The main bomb, which looks like a 1,000 kg version, fits under the fuselage. One of the last steps is attaching the forward fuselage piece, but I'd do that prior to gluing the wings in case the seam needs attention. Both a single piece and multiple section cockpit covering is provided. Bronco instructions are superbly done with some color coding and 3D drawings to help install parts. There are fictitious markings for five aircraft. Most are in a splinter scheme using late war colors and all of them have yellow bands or wing tips as fits for planes flying on the eastern front. Five nations are covered; Germany, Finland, Romania, Hungary and Italy. The Hungarian tail colors will need to be painted on. The Finnish insignia has split swastikas in the wrong color. They should be a light blue and not black. The decals are superbly printed, so whatever you choose will look great. 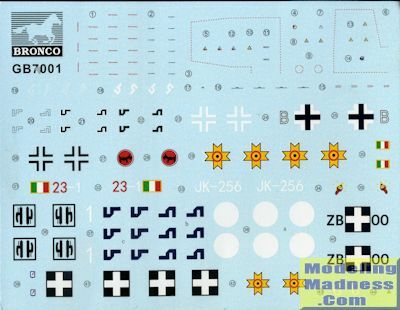 Of course, since this is Luft '46, you are not limited to what is provided in terms of colors or markings. I have always liked Luft '46 subjects and still have quite a few kits from a decade or so back when these were really hot items. I like that we are seeing new ones and perhaps it will help the genre take off and become popular again. Thanks to www.dragonmodelsusa.com for the preview kit. Get this one at your favorite retailer.